1. the act of lying down. 2. the position assumed in lying down. 3. obsolete term for pressure ulcer. adj., adj decu´bital. Andral's decubitus decubitus on the affected side, a position assumed in the early stages of pleurisy. dorsal decubitus lying on the back. lateral decubitus lying on one side, designated right lateral decubitus when the subject lies on the right side and left lateral decubitus when on the left side. ventral decubitus lying on the stomach. (dē-kyū'bi-tŭs), The correct plural of this word is decubitus, not decubiti. 1. The position of the patient in bed; for example, dorsal decubitus, lateral decubitus. 2. Sometimes used in referring to a decubitus ulcer. 1. an act of lying down; the position assumed in lying down. lateral decubitus lying on one side, designated right lateral d. when the subject lies on the right side and left lateral d. when he lies on the left side. a recumbent or horizontal position, as lateral decubitus, lying on one side. 1. The position of the patient in bed; e.g., dorsal decubitus, lateral decubitus. 1. The position of the patient in bed; e.g., dorsal decubitus. 2. Sometimes refers to a decubitus ulcer. 1. the act of lying down; the position assumed in lying down. lying on one side, designated right lateral decubitus when the subject lies on the right side and left lateral decubitus when it lies on the left side. an ulcer due to local interference with the circulation; called also pressure sore. The ulcer usually occurs over a bony prominence such as that of the sacrum, hip, heel, shoulder or elbow. Excessive or prolonged pressure produced by the weight of the body or limb is the primary cause. In minimal pneumothorax, opposite lateral decubitus view is the preferred investigation over PA view expiratory film. Entre novembre 2004 et janvier 2010, 141 patients ont subi 159 NLPC en position de decubitus dorsal modifie (DDM). In addition, right lateral decubitus positioning identified four previously undetected fractures, including two in patients with no known fracture. Scarring, adhesions, and tissue loss in the wake of a decubitus ulcer significantly increase future risk. The first research question examines the optimal staff required to minimize decubitus ulcer costs. DISCUSSION: Decubitus ulcer results due to venous congestion. Menorah had written policies and procedures concerning the care and monitoring of decubitus ulcers including record keeping requirements regarding the treatment and status of ulcers as well as for notifying physicians and the Director of Nursing. There hasn't been anything principally new in the treatment of decubitus ulcers in recent years. When you're culturing a decubitus ulcer, it's basically like putting a Petri dish in the patient's bed. Defending a decubitus ulcer case is always a challenge, and economics is never a defense. 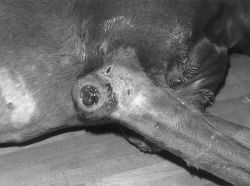 Hospital-acquired decubitus ulcer and/or deterioration of an existing decubitus. com/reports/c52926 ) has announced the addition of Decubitus Ulcer Treatment Products - Global Strategic Business Report to their offering.